Some days it’s good to eat no carbs. I do love my carbs, but today is a carb-less day for me. Here is a pizza you can make and not even miss the crust. Both my hubby and I really enjoyed this one. It’s also good without the bacon and with mushrooms instead… but who doesn’t love bacon!!! Preheat your oven to 425 degrees with a large cast iron skillet slightly oiled in it. In a large pot with the lid on, steam cauliflower in chicken broth until fork tender and liquid is just gone. Mash cauliflower with hand masher then add grated Pecorino Romano Cheese, eggs, 1/4 tsp pepper, thyme and parsley. Mix until all the contents are combined evenly. When the mixture is combined, remove the cast iron skillet from the oven and evenly distribute the cauliflower mixture around the bottom of the pan creating the crust for the pizza. Return to the oven and cook for 30 minutes until golden brown and crust forms. In a separate sauté pan, heat 2 tbs of olive oil. When oil becomes hot, add chopped garlic and chopped oregano. Cook for 2 to 3 minutes until all the flavors are released into the oil. Next add the tomato sauce and reduce heat to a simmer for about 10 minutes. Remove the crust in the iron skillet from the oven and top with sauce, Gruyère cheese, bacon, additional herbs, and salt & pepper. Return to the oven and continue cooking until cheese has melted, about 15 minutes more.Allow the pizza to cool for 5-10 minutes before cutting. Plate a slice and top with a drizzle of pesto. My hubby said the leftovers the next day were even better. Just in for the weekend cooking! This looks so good!! I might have to try. This is beautiful! I am a GF’er most days so this works for me. Is the crust crisp at all? Could you please cook one for me? The crust becomes crispier the longer you cook it. That is why I cook it longer the first time. 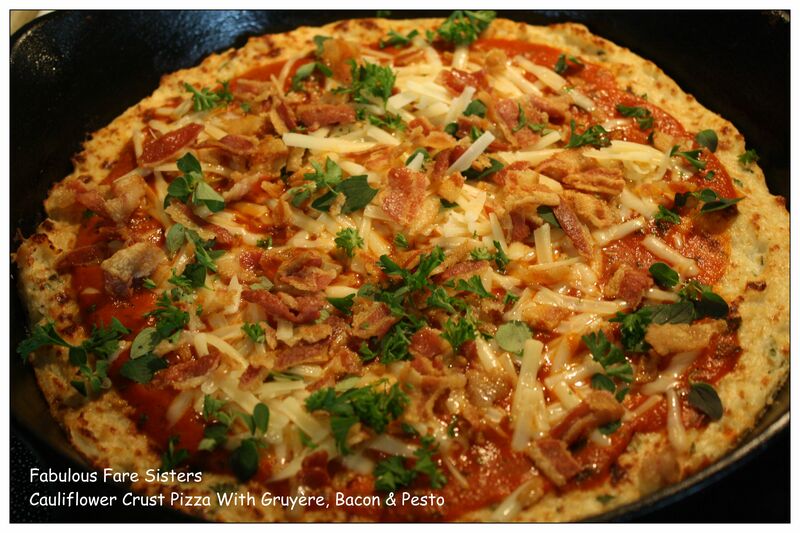 You can also use this recipe to make two crusts instead of one, then you will cook it less but make it more crusty. You will still need a fork no matter what. Enjoy. Thanks Heidi, I will have to give it my best shot. This sounds so good. Labor intensive but I’m going to try it this weekend. Not too labor intensive, but you do have to start early enough for the cauliflower to become crusty. Oh my that is so amazing!!! Wow! It’s just pizza, but thanks. The crust is very nice! YES! You make it sound so simple. Most other recipes make it seem like rocket science or brain surgery.